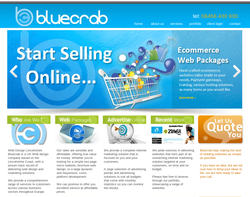 Web Design, Shopping Carts, Flash Designer, Domain Registration, Site Hosting and Search Engine Optimisation. Web Design, Hosting Packages, Web Site Maintenance Service, Secure Socket Layer Hosting, Content Management Systems, E-Commerce Solutions and Office Solutions. 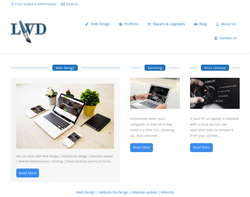 A creative Web Design company offering small business websites, content management systems, E-commerce solutions, Flash animation, virtual tours, html email campaigns, web development and web hosting. We have offices for Stamford, Lincolnshire, Peterborough, Cambridgeshire and Derby, Derbyshire. A wealth of experience in graphics, web design, photography, sales, sound and video underpin our capability and all work is kept in house wherever possible. 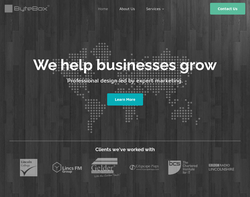 We design great looking websites, but not only that, we work with you to understand and interpret your business. We then convey your brand message by presenting your business in a design tailored to your specific audience. 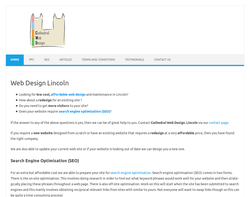 Based in Lincoln, Lincolnshire, UK, Cathedral Web Design offers services for web design, graphic design, photo restoration and retouching, web hosting and Search Engine Optimisation (SEO). We can produce websites that use Content Managements Systems (CMS) and ecommerce functionality. 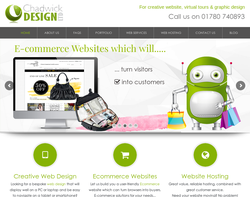 We provide genuinely affordable website design, including e-commerce, business printing and promotional gifts. For some businesses it is important to invest a large sum of money in a good website with lots of special features. But for many others that is not necessary or even practical. For local clubs, groups and charities it is especially unaffordable. This is where we can help. 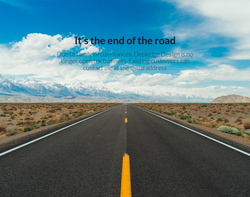 We have been designing websites since 2000 and know how to build simple but professional looking sites. We can also add lots of special features as well - but only if you really need and want them. 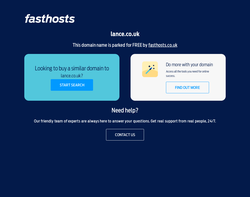 We aim to provide quality good looking websites at an affordable price for small businesses , charities and personal projects. Our eye catching & modern designs are built to stand out from the crowd. We don't follow... We lead. Equipped with creative minds, fast fingertips, and the latest technology, we take great pride in our diverse and exciting designs. Whether it's a single page site, or a full database driven e-commerce website, ByteBox offers you the best possible solution at very competitive prices. Having a website that stands out from the crowd is very important, as these days nearly all businesses own a website. ByteBox provide custom built, attractive, fast loading and easy to use websites that are designed to be noticed. 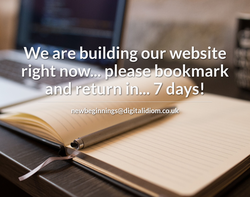 We believe a website should be something you can be proud of. Something that gives you a professional look and presence on the internet. We work closely with our customers to ensure our websites are designed exactly to our customers needs, and will help make your website successful on the internet. 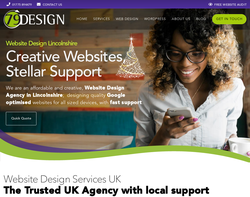 Web designers based in Spalding, Lincolnshire, we create web sites optimised for desktop to mobile for small businesses needing a 5-10 page web site, through to fully dynamic web sites suitable for shops, schools and organisations that would like e-commerce web sites. 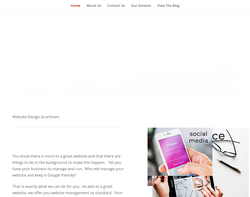 EBC Designs are a creative, cutting edge website design agency, who works with organisations of all sizes from start-ups to worldwide corporate companies. The designs created by the EBC team are expertly built to increase positive audience and trust. 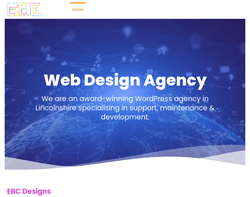 Lincoln web design and graphic design agency specialising in helping startups and medium sized enterprises. 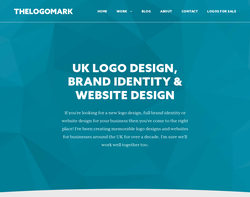 We create stunning website designs combined with memorable logo design and branding to give your business the corporate identity it deserves. 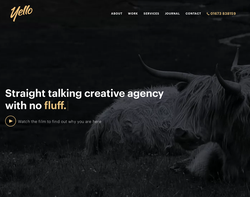 Straight talking creative agency with no fluff.